For her birthday, Tessa got books and a shopping spree at a local toy store. The George Hull Centre for Children and Families got $180. | ECHOage - Get great gifts. Give to charity. 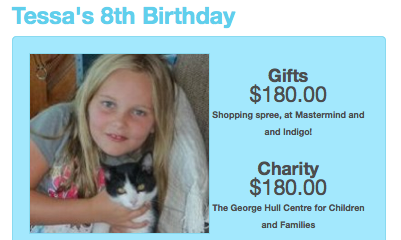 ← For her 5th birthday, Dylan got her own Ipod, and WWF got $260! For her birthday, Tessa got books and a shopping spree at a local toy store. The George Hull Centre for Children and Families got $180. From the outside, this birthday party was just like every other birthday party: bowling, balloons and birthday cake, but Tessa had her own thoughts about how her 8th birthday party could become so much more. The Centre provides professional consultation, support and family treatment for a broad range of problems affecting the mental health of children and youth. Happy 8th birthday to you Tessa! We hope that you had fun shopping at Mastermind Toys and Indigo. We would love to hear all about the gifts and books that you chose. You’ve already made this year extra special by reaching out and helping other young kids in need feel better!